I collected Flora, Pete, Katie (‘the Awesome’! ), Joe and Madeleine from Church Point and we set out for a morning exploring around Druridge Pools. Once I’d armed everyone with sample pots, hand lenses and magnifiers, Ragwort was scrutinised closely for Cinnabar moth caterpillars and they were soon tracked down and subjected to close inspection. Spiders, slugs, snails, bees, hoverflies and a Small Copper butterfly were also potted and looked at in detail. Much further along the size spectrum, Black-tailed Godwits and Grey Herons offered ‘scope-filling views and empty Swallow nests were easily accessible. Common Darters stayed just beyond our reach, and soon a whole morning had passed and it was time to head back to Newbiggin. A late brood of Barn Swallows, still in the nest and being fed by their parents, were quite a size contrast to Grey Herons stalking along the water’s edge. Little Grebe, Tufted Duck, Mallard and Gadwall were dabbling and diving, small groups of Starling were heading to roost and, as darkness approached quicker than it would on a nicer evening, we settled into position to watch for Otters. We were in a struggle with dusk and the weather, but distantly, in the gloom of the waters’ edge, the tell-tale ‘Loch Ness Monster’ shape of an Otter was resting at the surface 🙂 As it moved around the pool, distant plantations and nearby reedbeds were used as landmarks so that everyone knew just where it was. Then it began moving closer and eventually came up out of the water onto an exposed patch of mud; an apex predator silhouetted against the dying embers of daylight as an unseasonably cold wind began cutting across us and the first drops of rain dimpled the water’s surface around the gulls, ducks and geese settling down for the night as their mortal enemy watched on with mustelid curiosity and cunning. Monday’s trip was a birdwatching tour of two of Northumberland’s excellent locations; the Cheviot Valleys in the morning, and Druridge Bay in the afternoon. I collected John, Graham, Andy, Sue, Sue and Lesley from their cottage in Shilbottle and we set off inland towards the imposing landscape of the Cheviot massif. As we got out of the car and donned waterproofs we had the first rain shower of the day, but it quickly passed and the path began gaining in altitude as Oystercatchers perched on fence posts, swallows and martins hawked back and forth through air buzzing with insects in the warm, humid conditions and Willow Warblers and Chaffinches competed with their congeners in a singing contest. The plaintive cries of Curlew echoed around the steep valley sides, the high calls of Siskin and the buzzy rattle of Lesser Redpoll came from overhead and one of the archetypal valley birds put in an appearance as we found a succession of adult and juvenile Dippers. A lone Common Buzzard hovered high over the moors in search of prey and a Peregrine repeatedly rose above the skyline before dropping back down in a prolonged attack on an unfortunate, and unseen, victim. I always enjoy meeting up with our previous clients again, and Saturday morning found me at Newcastle Airport waiting to meet Jacob and Nancy as they arrived for a couple of days birdwatching in Northumberland. They were going to be spending Sunday on the Farne Islands, but our destination on what was developing into a gloriously sunny Saturday was the North Pennines. Just 12 days earlier I’d been marvelling at the temperature of 1C at 10:30am but now Curlew, Lapwing and Oystercatcher were all flying around and calling noisily as we reached the higher ground southwest of Hexham, Skylarks were singing exuberantly against the azure sky, Meadow Pipits were ‘parachuting’ down at the end of their song flights and Common Snipe were calling from concealed positions in the grassland. In the stunning light, Barn Swallows were eye-wateringly iridescent, a pair of Golden Plover flew in front of us and a pair of Red Grouse watched closely over eight chicks. Red Grouse was a lifer for Jacob and Nancy and one male allowed a very close approach and provided a lot of photo opportunities for them. Eyebrows, raised, eyebrows lowered, facing left, facing right, staring into the lens; he went through a veritable supermodel repertoire of poses before seemingly melting into the vegetation. As we travelled across a high moorland road, a Northern Wheatear posed obligingly for photographs. 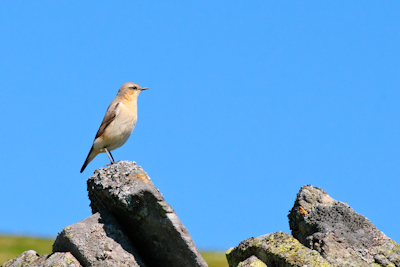 Skylarks and Meadow Pipits provided a memorable aural backdrop to our lunch stop, and a Golden Plover was silhouetted on top of a nearby ridge, keeping a close eye on it’s territory. Near perfect weather, a gentle breeze, spectacular landscape and stunning birds; what more could you want from a day’s birdwatching?